Ideal for families or couples looking to be fine without a car. The place is ideal for a sun, beach in a very nice atmosphere. The apartment was fine, perfect, very friendly and caring staff. The resort is in the best tourist area of the island, between Cristianos and Playa de Las Americas. 15 minutes from the airport and very close to a large supermarket. There are plenty of bars, restaurants and pubs. Hotel tip: Were in this apartment B-302. Well equipped and comfortable, buna guidance afternoon sun on the terrace overlooking one of the pools and the beach. There are luxury apartments but they are quiet and comfortable, with plenty of light. We went to the Torres del Sol just to get away from the rain and snow, I had never been to the Torres before, I was told by Paul of Spanishisles.com that the complex was basic but was in a super location for the beach, resturants and bars, Los Cristainos and Las Americas was a short walk from the complex. Paul was not wrong, the apartment was basic but very clean, the complex had a new pool and a complete new lift system. The view from our room was great. We stayed in these apartment and we could not find fault. The pool area was clean as was our apartment. It was well equipped....well no TV but microwave toaster and kettle. We were in the low rise apartments and not the towers. Joanne even got us a taxi for Sunday morning for six am as we had an early flight. Would go back again. We stayed in an apartment suitable for disabled as my husband is in a wheelchair. We found it ideal, the apartment was spotless and although the hotel is a bit old it looks as if a lot of the rooms are being updated. All the lifts are being replaced so you should have no problems with getting to the top floor. 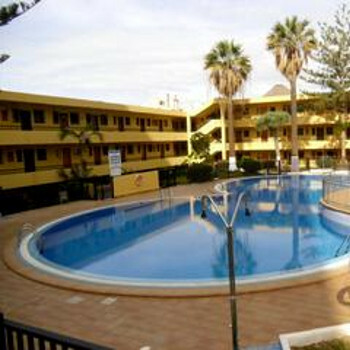 The Hotel is brilliant for location, a few yard to the beach and a level walk into Los Cristianos or Las Americas. There is also a supermarket close by to supply you with all your holiday essentails. The bar is run by a British family and each time we used it they were very welcoming and although we only had a few breakfasts in the bar it was freshly cooked and very nice. The only downside was perhaps the entertainment, Karaoke everynight but it wasn't too bad as most nights you would be out enjoying yourself. All in all a nice enough hotel with is basic, clean and most of all central to everywhere. My husband and I have stayed at the Torres now 7 times,we have always found it very clean, and the staff friendly. We have stayed in apartments in the tower block and also in low rise, both were furnished well, and clean, we had a few problems with beds and hot water but they were put right within a few days. We even had two new mattresses delivered. I cant fault the standard at the Torres, we will be there again this year staying even longer. The had to write after seeing the Report by Studley. We came back from the Torres Del Sol on the 24th Dec 2005 and we went the the same Son & Mother Family Business and it incensed me. Paul & Joan were so helpful to us and the Complex was just great that we have already re booked again with them. We did have one thing that was wrong, the sofa bed was not right but within 2 hours after reporting the fault it was replaced with a new Bed. We arrived at the Torres Del Sol complex in November. We rented the apartment for 1 week from an english firm run by a son and mother. The rooms were filthy when we went in and so old fashioned it was untrue. The double bed was a metal frame put-you-up that looked on the point of collapse and the sofa bed was just as bad! The rooms smelt, the bathroom was filthy and i kept getting a shock off the washing machine! The complex was great though and handy for the beach and the english bar downstairs did lovely breakfasts! I would go to the complex again but I would rent from somebody else as the company we went with were rubbish and after complaining to them all they said was "sorry!" The other apartments we saw were really done out nice though, I think ours must have been the worst in the whole complex!! Upon arrival our apartment smelt of something that can only be described as 'rotting', this we soon discovered was the sink. Also we had no hot water and no gas- so no cooking for us- thank god for the toastie maker! The decor was 'seventies' as were the appliances and the sofa bed was completely collapsed on one side. The pool was dirty and surrounded by feral cats, and the nightlife was non-existent. Would not recommend this hotel! I visited this hotel during the summer, and upon arrival were disappointed with the the outside appearance. However the room was recently decorated and very well kept, but was rarely visited from the maids. The location is the best thing about this hotel, as it is literally 2min from the beach and bars, and Veronicas strip is 5min in a taxi!! The location does have privately owned homes, usually by the Spanish who are not very friendly and never sleep in!! I would recommend this accommodation to young groups who are looking for a pleasant base just to sleep in, and somewhere that is close to the nightlife. The apartments consist of 2 15 storey tower blocks surrounded by 3 storey annex units(see Tenerife photos). There are 2 swimming pools,while we were there 1 pool was closed due to safety reasons. The majority of these appartments are privately owned and then rented off. Our appartment was on the 3rd floor of the annex facing the sea. Our unit consisted of a kitchen/lounge a bedroom with double bed built in wardrobes 2 bedside tables and a chair. The lounge/kitchen consisted of a bed settee,4 stools,a breakfast bar, a combination microwave,a fridge with icebox.a kettle,a4 ring duel hob and oven/grill and varius units housing the pots pans cups and varius utensils. The bathroom consisted of bath/shower,toilet and washbasin.The appartment also had a sea view balcony with 1 patio table and 3 chairs. The appartments did not have air con but did have ceiling fans in the lounge and bedroom.The linen was only change weekly and that includes the towels.Any cleaning that was required was done by ourselves,there was a brush dustpan mop and bucket supplied. On our 1st day in the unit our toilet was blocked and flooded our appartment now I know why the supplied the mop and bucket the mop also doubled up as a plunger for the toilet. After 2 days of plunging they decided to put a new low level suite in.After breaking up the pan they found 2 golfballs had caused the blockage.Before you ask they weren't mine. The location of the appartment is right on the beach at Playa de las Vistas,so its in a prime location for the bars restuarants and of course the beach. The appartments also has its own bar/cafe which was a bit dated can't comment on the entertainment as I was never on site altough I believe there's karioke 2 or 3 nights a week.